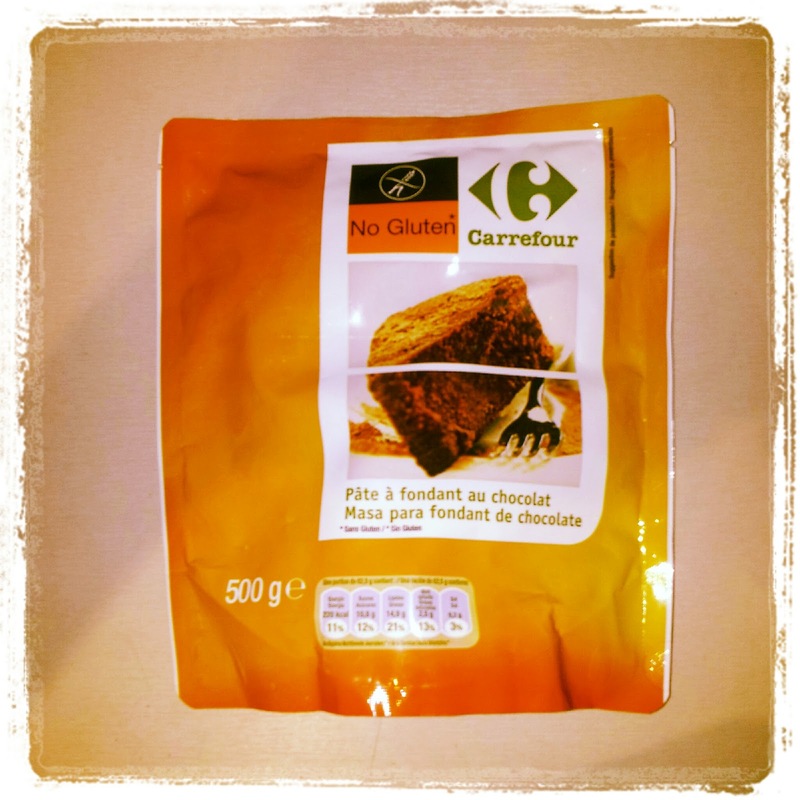 Gluten-free baking for dummies: can this cake mix change the face of catering for coeliacs? Sometimes gluten-free baking requires a little bit of knack. The springiness that gluten imparts on baked goods means that using substitutes like buckwheat flour, rice flour or one of the many blends sometimes necessitates a pinch of something extra, like psyllium husk (see here for Gluten-Free Girl's explanation). But the idea that you need to be some kind of wizard to bake gluten-free is a myth. I've heard plenty of hand-wringing from bakeries, restaurants and cafes about how it's just so hard to replicate anything gluten-free that they gave up trying. The ingredients are impossible to source, they tell me, we can't produce something of the right quality. I hear all the time that it just isn't feasible to create a gluten-free dessert for the 1 in a 100th customer who might ask for one. But I'm calling time on these excuses. Basic gluten-free cake baking can be a complete doddle. In fact, it just got a whole lot easier now that European supermarkets are selling a ready-mix to make gluten-free chocolate fondant cake. I don't mean those 'just add an egg, water and butter' cupcake cake mixes. There is nothing to add. Put one of these babies in your cupboard and the next time you have surprise gluten-free guests (or just a midnight urge for chocolate cake), you can go from hungry to dessert heaven in less than 20 minutes. Gloriously thick, slightly resembling chocolatey tar, but who cares? Even I could achieve this with a raging hangover and barely half an hour to spare. That's right. You're done. Shove the baking tin in the oven, wait for a few minutes, and bite your fingernails nervously, worrying about what kind of culinary monstrosity you're about to unleash on the world. How could it possibly taste good, without any whipping, creaming, rising or any of the chemical magic we're told is essential to produce an edible gluten-free cake? 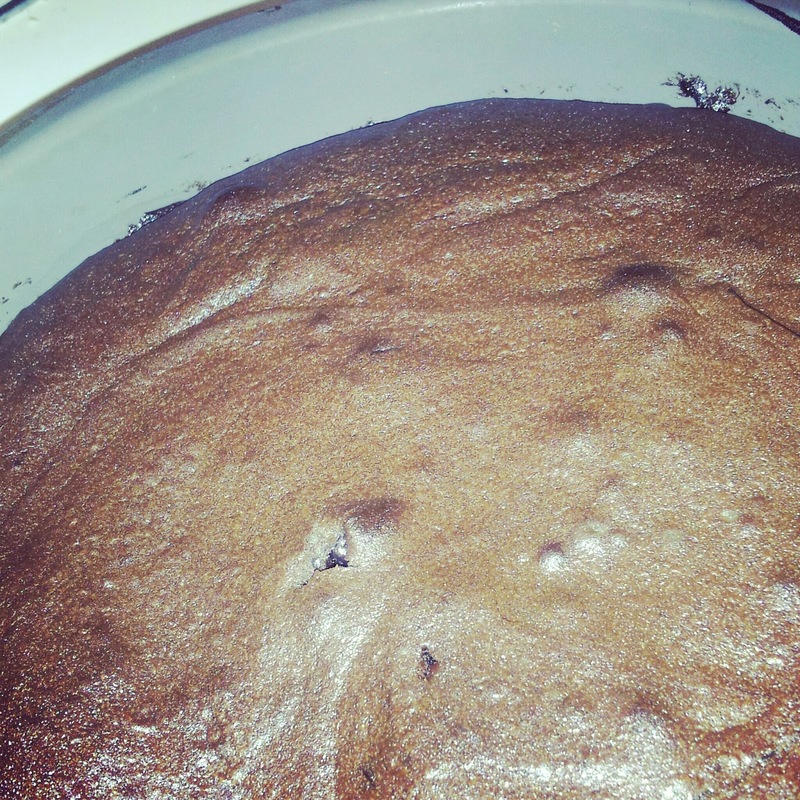 But there it is, after 15 minutes in my oven, it's looking exactly like a chocolate cake should. Warm, fluffy, a little bit like the surface of the moon, smelling divine and begging for a generous slathering of ice cream. And here's the real shocker: it was actually a lot better than some of my bespoke gf chocolate cake creations. 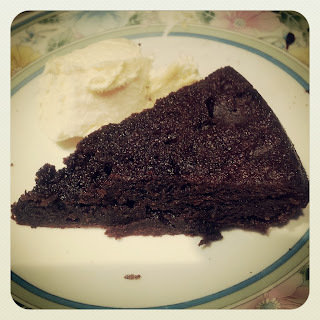 It was very rich and smooth, and hot from the oven it was moist enough to serve as one of those melty-on-the-inside chocolate fondants (or self-saucing puddings as the Australian Wheaty Eater calls them). Naturally, I rushed a slice over to the Wheaty Eater to get his verdict on the cake. He's partial to a self-saucing pudding, has a weakness for chocolate, and his nose was twitching at the chocolatey aroma from the kitchen. My initial intention was not to admit it was a ready-mix until I had his verdict on how it tasted, to keep him impartial. But that didn't quite work out. I got so much praise for the cake that I couldn't bear to let on that this was a product of French culinary genius and not of my own hours wasted in the kitchen. I smiled serenely, lapped up the praise, and helped myself to a second slice. Sorry, Wheaty. The verdict: The fact that this is achievable will soon demolish the excuses that restaurants give for not providing more than a fruit salad for gluten-free guests. As mixes like this become more readily available (and good lord, they most certainly will), it will become a lot harder for caterers to claim they don't have the time or resources to provide for coeliacs. The future is nearly here, and it tastes pretty sweet. Are there gluten-free mixes or ready-meals that have changed your life? Or do you cook everything from scratch? Let me know in the comments! I still fail to understand why bread and cakes are an essential dietary item? I find it odd that people believe they need to eat bread at all. There are continents full of people who *never* eat bread. You can initially see the bare bones of an argument here. 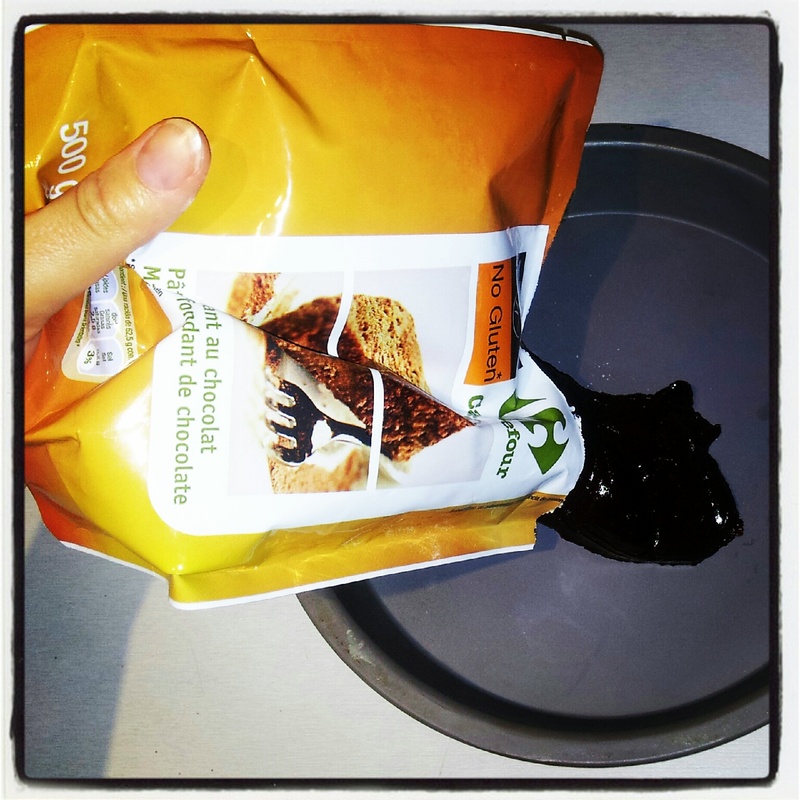 Why agonise over finding a gluten-free muffin that doesn't disintegrate in your hand? They're only muffins, eat something else. Why hanker for gluten-free bread when there are naturally gluten-free carbs and sources of fibre like brown rice or potatoes? 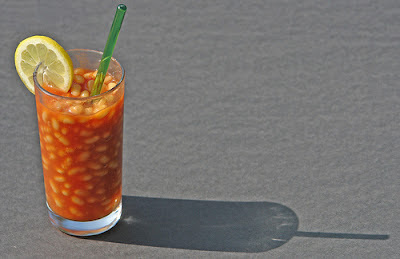 But then the baked beans comment had to go and ruin it all. That sneery implication that coeliacs should just be grateful for any old scraps. Sure, while you tuck into that cinnamon roll, baguette sandwich or cream cheese bagel, I'll just reach into my handbag for my emergency can of baked beans. Perhaps I'll even eat them cold as a punishment for daring to have such an inconvenient diet. Only someone 'faddy' about their food could possibly disagree! I'm not going to delve into the sticky issue of gluten-free food on prescription just now. But I will give you my top three reasons why gluten-free substitutes for ordinarily wheaty food are a very good thing. 1. Food nourishes people's mental health, not just their bodies. Do you remember your summer holidays as a child? I do; my parents took my brother and I to Wales, where we'd fight against the inevitably rainy weather by having fish and chips on the beach, building sand castles and choosing ice creams that dripped down the side of the cones as you ate them. These memories of innocent times are powerful, and those of us blessed with happy childhoods find a lot of comfort in them. Having to follow a special diet can alienate you from your own memories and the culture you grew up in. You start feeling pretty ambivalent about that battered fish and chips when you know it might have been damaging your body all along. 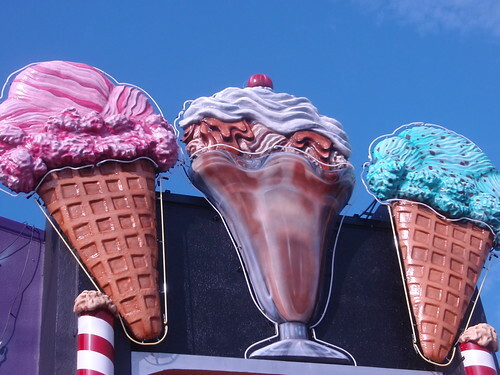 Those ice cream cones are a fuzzy memory you can never relive again. It's a huge emotional side-effect for coeliacs, knowing that a phase of your life and all of its associated flavours might be over. But it doesn't need to be that way. Gluten-free substitutes for these foods aren't going to save the world or boost your health - heck, they'll probably make you chubbier. 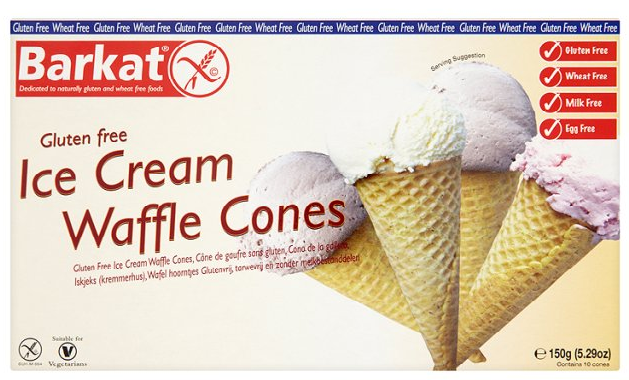 I'd never suggest that your doctor should hand you gf ice cream cones as part of your prescription, but the fact that they exist is pretty damn wonderful. 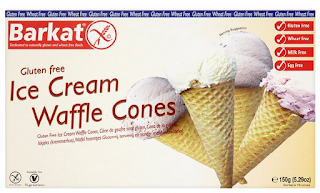 While I'm very happy with gelato in a cup, I did a little dance of glee when I discovered gluten-free waffle ice cream cones, and I got a giddy nostalgic hit when I ate one. It made me happy, it made me smile, it was an awful lot better than baked beans. 2. Gluten-free substitutes encourage culinary ingenuity. I used to think you made a cake with flour, eggs, sugar and butter. Now I know you can make it with none of the above. Melted chocolate, pureed beetroot, pistachio nuts, grated carrots, courgettes, whole boiled oranges blitzed in the blender, mashed bananas, ground almonds... is your mouth watering yet? All of these have played a tasty part in my baking in recent years. And this isn't a phenomenon just for the coeliac pack. Wheaty eaters also benefit from the creativity involved in making gluten-free substitutes. Plenty of my gluten-eating friends are partial to the richness of a flourless chocolate cake, a grainy polenta loaf, or that phenomenal parsnip, pear and salted caramel cake from London's Borough Market (I mention this one a lot). The love of a good cake - universal. Knowing a way to transform mangy beetroots into a moist chocolate cake? Priceless. 3. Gluten-free food isn't a punishment. Some people get really irritated by alternative foods. Creative substitution in food is seen as a 'hippie' fad, and it sparks a strange kind of protectionism in some people: Cakes aren't for you any more, take your rice crackers and begone. A friend once told me about an incident at her work Christmas party when the waiting staff came over with a plate, announcing, 'Gluten-free food for someone here?' and the (drunk) people around the table murmured, 'Urgh, gluten-free?!' They were actually annoyed that someone had dared to be different, even though it wasn't out of choice. Well, guess what: coeliac disease isn't a curse. It's not a punishment for too many donuts in a past life, so there's no reason for us all to sit crying in a corner while we nibble a lettuce. Not having dietary requirements doesn't make you a hero who has earned those pancakes, any more than coeliac disease means you should rule out bread for life when perfectly good substitutes exist. To the nay-sayers, tough luck: we coeliacs intend to have our cake, eat it, and lick out the frosting bowl when we're done. Supportive friends and family are heaven sent when you switch to a gluten-free diet. But unfortunately there are people out there who make life much more difficult, whether they mean to or not. We've all met them: barbed comments about being fussy, scientific insights into how your condition doesn't really exist, or the waitress who thinks you've invented an intolerance just to make her day a little bit worse. Only recently, someone exploded in condescension when I politely turned down their offer of a flapjack. How dreadful for me to have to follow a special diet, they wailed, when "all gluten-free desserts are so terrible!" Since a sweaty store-bought flapjack is hardly something that lends itself to fevered dreams, I was a bit startled. I can forgive someone for not knowing that with a bit of baking knack, you can make gluten-free cakes that blow the wheaty ones right out of the water. I didn't know this myself until I starting experiments in baking. But any sweeping statement that disses naturally gluten-free dessert wonders like raspberry pavlova, creme brulee and chocolate mousse needs examination. My problem with this hater is not that they don't understand what a gluten-free diet is (plenty of people don't know until they need to). It's the fact that they try to persuade you of how awful your life must be. With this particular charmer, I shrugged and said, "It's fine once you know how to bake and where to find great food." "Oh noooo," he breathed. "I've worked in a restaurant. 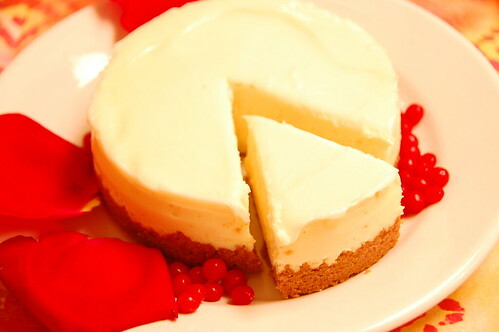 I tried the gluten-free desserts and they were all. So. Bad!" It's hard to have a reasonable discussion with this kind of hater because they're coming from a very passionate place. Maybe they think they're showing empathy by telling you gluten-free diets are all salads and cardboard-textured bread. Or maybe their life happiness is genuinely very strongly invested in Warbuton's sliced bread. If you explain that you're happy with your diet, they'll insist you shouldn't be ("But gluten's in EVERYTHING!"). Frankly, they're amazed we haven't all jumped off a cliff at the prospect of never touching a Krispy Kreme again ("I'd just DIE if I couldn't have donuts!"). Much of the time, they'll protest deep knowledge and insight from the one time they tried some bad quality gluten-free pasta (or in this case, working somewhere that served a crap fruit salad). Most gluten-free dieters have heard plenty of this rubbish before and have the thick skin to ignore the Pity Parader. But this breed of hater is damaging to newly diagnosed coeliacs, who are struggling with the diet switchover and might abhor drawing attention to their diet. How to cope with this one? Distance. Plenty of people who have tried my cakes are converts to the wonders of gluten-free baking, but some people just aren't worth a bun. They say: "It must be so awful to be gluten-free!" You say: "The worst part is conversations like this." Next time: the evolutionary theorist.